Groceries are expensive. Often you splurge to get the healthiest, freshest foods you can for your family. If the only fruit your toddler will eat is plums, you’ll pay an arm and a leg to get them off-season. If your older kids eat bananas like their candy, bananas they shall have. If you’re like me, you can’t go to the grocery store daily. You go every week or two. Sadly that means many of our pricey foods spoil or just lose their freshness between shopping trips. 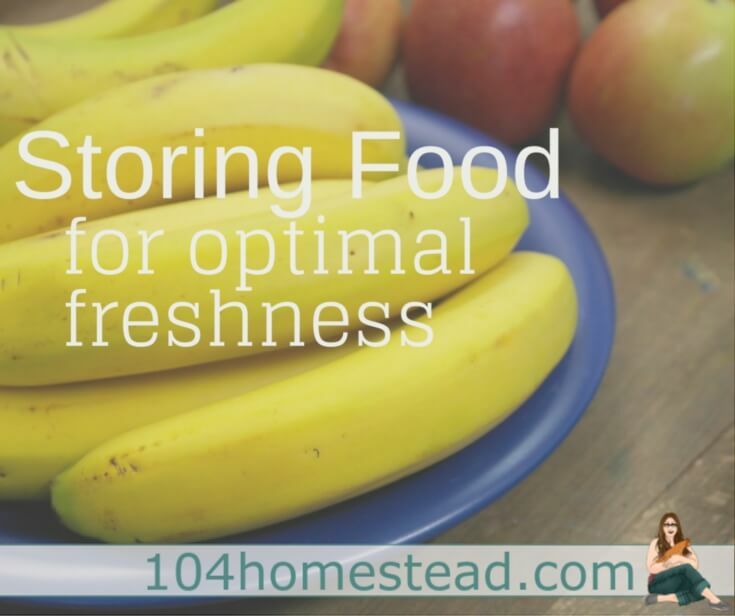 Proper storage of your food will increase their freshness duration and prevent premature spoiling. Having ripe bananas on hand that stay good for a week (or two) requires a bit of work. When purchasing bananas, buy enough ripe ones to last you two days. Buy the rest just shy of ripe. When you get home, store your ripe bananas on the counter and store your unripe bananas in the fridge. The cold slows down the enzymes that ripen bananas. Whenever you eat one of your ripe bananas, pull out one from the fridge. It will only take a day or two for your bananas to ripen once brought to room temperature. Apples store best in the fridge (or below 40°). If you don’t have the room in your fridge, check out this article about storing produce for a long winter. This will give your apples the best odds for staying crisp and flavorful for the long haul. Grapes stay fresh and crisp when stored in a perforated plastic bag in the fridge. Often the bags they are sold in are perfect, but some produce bags don’t have holes. You can purchase reusable produce bags so you always have some on hand. Do not wash grapes until you are ready to eat them. Excess moisture can cause rotting and/or molding. At best, asparagus will stay good for 3-4 days. Unfortunately there isn’t any magic that will keep it fresh longer. A little known trick for keeping it at its best is to store it upright in a container with 1″ of water in the bottom, then loosely wrap the top with plastic. It will taste like it was just cut moments ago. A salad spinner is key to keeping lettuce fresh and pleasant to eat. No, it’s not just another kitchen apparatus that will collect dust on the shelf. Don’t discard limp or wilted lettuce. Separate the leaves of the lettuce and allow it to float in cold water, swishing occasionally, for 20-30 minutes. This cold bath may very well revive it. After the cold bath, briefly rinse the lettuce leaves and place them in your salad spinner. Spin the lettuce until dry. Lay out two paper towels (or unpaper towels) and place the dried lettuce on top. Roll it all up burrito-style and slip it into a gallon-sized zip-lock baggie. Squeeze out the air and store in the fridge. Your lettuce should last at least a couple of weeks. The key to keeping your onions fresh is temperature. Too hot and they’ll begin to sprout. Too cold and they’ll rot. The ideal temperature for storing onions is 40-50°F in a dark location. Pantyhose are great for storing onions in because it allows air to circulate. You can find more information about keeping onions in Storing Produce for a Long Winter. Nothing spoils a good mood like finding spoiled bread when you go to make your afternoon sandwich. It’s even more true when your bread is homemade. Homemade bread lacks preservatives so its lifespan is even shorter than bread from the store. The same storage technique will work for both types of bread. Buy un-sliced bread or refrain from pre-slicing homemade bread. By cutting through the crust you are allowing air to circulate throughout the bread. While you’re at it, stop putting bread into plastic bags. The crust wants to breathe and you’re suffocating it. Instead, store bread out in the open with the cut side down or store in a paper bag with the end loosely folded. I use the paper bag method because I have a cat who enjoys snacking on fresh bread that is left out unsupervised. Okay, so milk isn’t a food per say, but we consume it, so I’m letting it slide. You know how you have that space in the refrigerator door that is just the right size for a milk jug? Stop using it! Two things destroy the integrity of milk: light and inadequate temperatures. Unless you live in a polar dungeon, every time you open the fridge you are exposing the door to light and warm temperatures. Store your milk near the back of your fridge to keep it fresh for as long as possible. 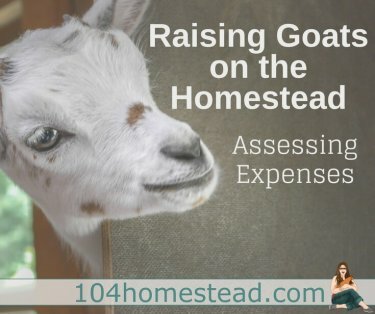 Another option (unless you have a milk-loving family) is to buy a week or two’s worth of milk in 1/2 gallons. Exposure to air speeds up souring so unopened cartons will last longer. Be sure to save your empty milk jugs so you can garden in the winter! Do you have tips for storing common foods? Share them in the comments below! Just found your blog. I like it so far. Thank you for spending the time on it for us..
You are so welcome Alexandra! I am so happy to have you here! Hi a tip from my Grandma if you have limp letuce place in cold water with a lump of coal, wash the coal first, and leave for an hour or so it crisps up beautifly. Then put in a tea towel and shack out the water leave in the tea towel until you use it. It realy works.